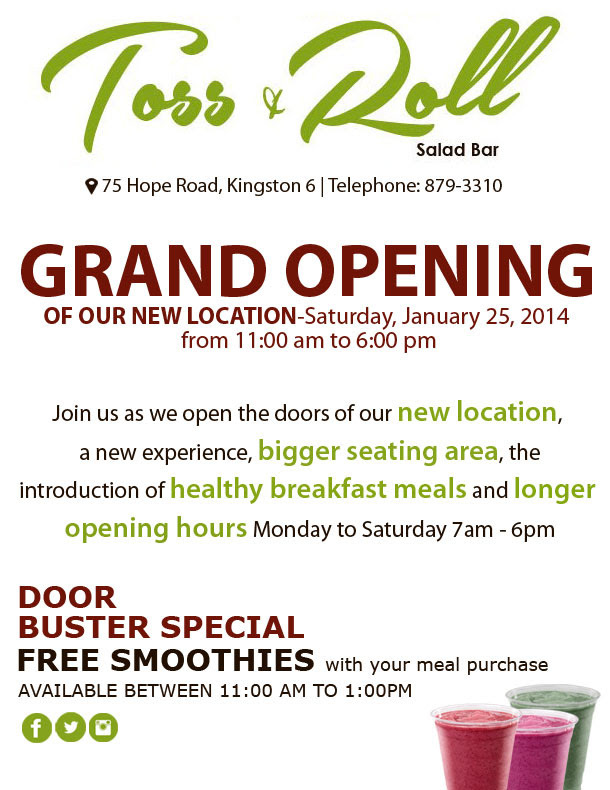 A few months ago I published a post on my experience at Toss and Roll, one of Kingston’s hottest and most recently opened salad bars. Since then I’ve received a number of great reviews from friends and colleagues who have eaten there, but the main concern was the location; it didn’t offer much seating capacity, and the limited al fresco set-up meant it only allowed for casual lunch meet ups. But that’s all about to change. As was expected, things kicked off and the demand for more space, longer opening hours, and a more central location became pertinent. Just under nine months in, Toss and Roll will be relocating to 75 Hope Road (beside the recently opened Opa! Greek Restaurant) and will extend their hours to 7:00 a.m. to 6:00 p.m. Mondays through Saturdays. The redesigned menu will feature a variety of new dishes including a breakfast fare, assorted teas and smoothies, along with long-standing crowd favourites. Of course, fitness junkies and owners Keisha and Jermaine Bailey have managed to keep the menu quite clean and lean with fresh fruits and veggies, whole wheat offerings, and lean meats. Come and check out their grand opening tomorrow Saturday, January 25 and enjoy discounts and free smoothies. This entry was posted in Food, healthy, Product Review, Restaurants, Uncategorized and tagged breakfast, eat clean, eat fresh, eat healthy, eat local, fitness, food, fresh, health, healthy, healthy-living, Jamaica, kingston, lunch, lunch spot, nutrition, restaurant, restaurant opening, restaurant review, salad, salad bar, Toss and Roll, vegetarian, wrap. Bookmark the permalink.